Now that we’ve completely wrapped up Q2 2012, I think it’s time to look back at the past three months and evaluate my trading performance. Let’s look at the numbers and recap my most memorable trades! Well, well, well… These numbers look familiar. They look almost identical to my trading stats from Q1 2012! My win % was still below 50% last quarter, but what kept me alive was that my average winning trade remained much larger than my average losing trade. Oddly enough, even the swings and dips in my account balance look similar to that of Q1 2012. 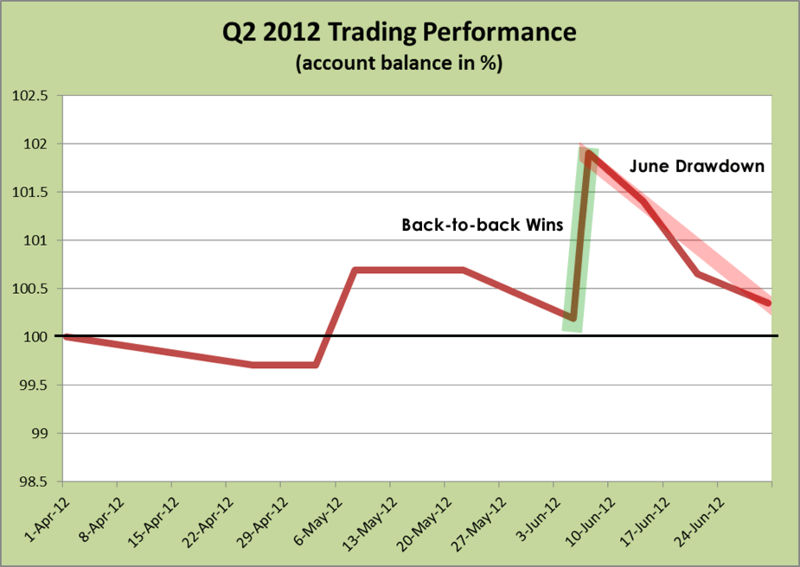 As you can see below, I had a slump in the first month of Q2 2012, but rebounded nicely midway through the quarter. However, I ended up experiencing a big drawdown (-1.55%) in June, which erased a good chunk of my gains. Drats! You may have noticed that I still have one trade open, my EUR/CHF long trade. I’ve been holding this pair for a while now, and though it hasn’t moved much at all this quarter, I think that the underlying idea behind the trade is still valid and that this pair is still worth holding on to. Gotta have faith in the SNB yo! Now, let’s take a look at my most memorable trades for the quarter: my biggest winner and my biggest loser! 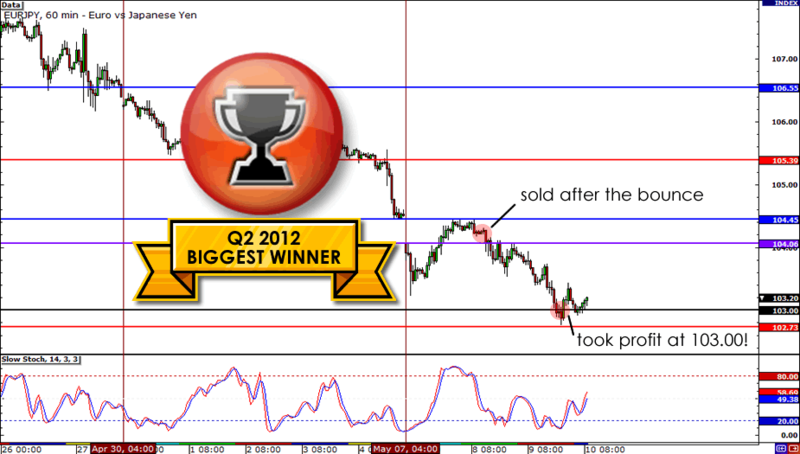 My biggest money-maker for the quarter came in the form of my EUR/JPY trade, which gave my account a solid +0.98% return. Now, it didn’t have the most mouth-watering return on risk (just about 1.3:1), but it’s a good thing I decided to trade this setup with a good-sized position. The trade had a solid technical setup (I sold the market as it filled the weekend gap) and it also had strong fundamental backing. No wonder this trade was painless from start to finish! It went as smoothly as trades could go; not for a single second did the market trade against me. If only every trade were as perfect as this! Ha! 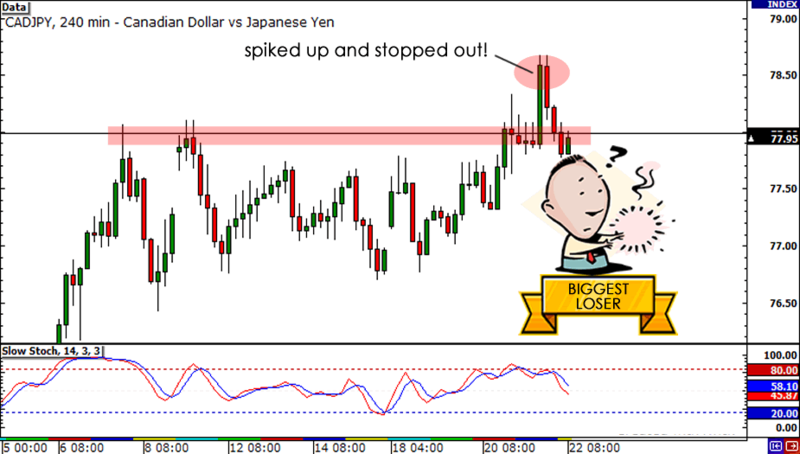 Taking a hit on this CAD/JPY setup was a tough pill to swallow because, for the most part, my fundamental analysis was spot on. The combination of poor data from Canada as well as weakening Chinese commodity demand led to a drop in the Loonie and I really thought I was gonna make a killing on my CAD/JPY trade. However, the markets were spooked on rumors that the Bank of Japan would be implementing new monetary policy measures. This sent yen crosses spiking higher, causing my CAD/JPY position to stop out. The only good part of this trade was that I limited my risk and took home a loss of just 0.75%. Despite the number of losses that I took this quarter, it could have been worse if I didn’t take into consideration all the uncertainty in the markets. I felt it was important to scale back my risk on some of the riskier setups, especially since price action on the cross-currency pairs got kinda choppy for a while. For the most part, my losses ranged from between 0.30% to 0.75%. If I had been risking a full 1% on each of my trades, the sheer number of losses could have led to a really disastrous quarter. While I did limit my risks, I also feel that I could have done much better this quarter. Yes, there were some really choppy moments, but there were also some pretty solid moves in May. Looking back, EUR/JPY dropped a whopping 900 pips while GBP/JPY slid 1,000 pips. And this was in the month of May alone! These were missed opportunities that I have to take better advantage of. The lesson here is that sometimes, it pays to be a little more aggressive. As long as I practice good risk management techniques, I shouldn’t be afraid to be more daring in going for those huge winners. As I mentioned earlier, one thing I noticed while writing this performance review is that I experienced a lengthy drawdown near the end of the quarter. Looking back, the exact same thing happened during the first quarter as well! This indicates that for some reason, I tend to lose focus near the end of the quarter and that’s when my trading (and account balance) suffers. I have to learn to be more consistent and to maintain my focus day-in and day-out. I can’t choke near the end of the quarter like Lebron Jam… (Oops can’t make that joke no more!). And that wraps up another quarter in the life of your favorite one-eyed trader! I’d like to give a shout out to all of you, my adoring forex friends, for following me on my quest towards being an elite trader. I love each and everyone one of you! If you have any questions or suggestions about my trading performance, feel free to hit up the comment box below! Happy Fourth of July everybody! Don’t party too hard!